There's going to be a total solar eclipse tomorrow, on the night of 13–14 November. The totality should last about four minutes. Sadly the eclipse won't be at all visible from the UK and the totality will only be seen in northern Australia and the southern Pacific Ocean. A solar eclipse takes place when the Moon passes between Earth and the Sun, obscuring the the Sun for those watching on Earth. A total solar eclipse can be seen when the Moon's apparent diameter is larger than the Sun, blocking all direct sunlight. 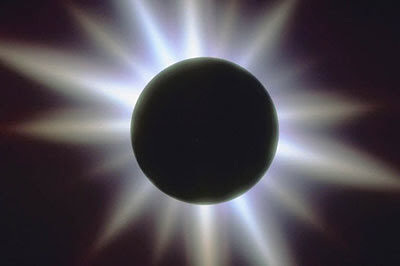 This Solar Eclipse is occurring on the Diwali Day, which is the Hindu festival of light. For Hindus, Diwali is one of the most important festivals of the year. It lasts for five days and during that time lamps are lit to symbolise the triumph of good over evil. Lighting lamps would also be the perfect thing to do during the time of the solar eclipse, to symbolise light shining in the darkness to offer hope and to reveal hidden secrets. It is a shame that I won't get a chance to see this solar eclipse, but those of us in the UK will feel its influence even if it is not visible to us. And maybe my friends down under will tell me what it was like.